Homeowners like to see their home increase in value — it means you made a good decision purchasing this property. Kudos to you! But before you start high-fiving about how much your home is worth, you might want to take a closer look at your tax assessment. Remember … the higher the assessment, the higher your tax bill. 1. What happens if you’re not happy with it and think it’s too high? 2. How do you prove that the true market value of your home is less than the assessor’s estimate? Whether you’re a new homeowner or not, you should carefully look at your assessment each year to look out for mistakes and understand the process. That way, you’ll know what steps you need to take if you want to appeal it and lower it. This is why you are receiving a copy of your bill when your mortgage lender is actually paying it—because you, as the homeowner, are actually responsible for any mistakes. Now is your time to take a look and make sure everything is accurate before your lender pays it. With home prices rising in many jurisdictions (some now at a decade high! ), it could be an accurate reflection of your current home’s value. Or, maybe not. It’s up to YOU to find out since most local governments aren’t in any rush to reduce tax revenue on their own. Many times you have a limited time to appeal, so know the deadline and the process in your jurisdiction! Become familiar with it now, so you’re prepared when you get that letter in the mail. Deadlines are very strict and must be met. 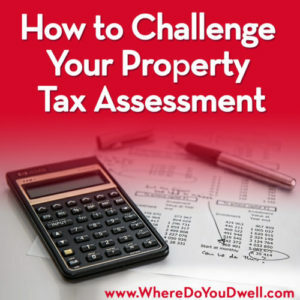 Here are four steps you need to take to see if you should appeal your assessment. Records are kept at your tax assessor’s office and can be seen any time to find out what your assessment value is for your property. Assessors use either replacement value or comparable sales prices to determine a home’s fair market value, which is considered the estimated price a home would fetch on the open market. Depending on the jurisdiction, the assessed value can be the full market value or a percentage of the market value (an assessment ratio). Homes aren’t always appraised every year but the assessor may apply average price increases from recent sales to adjust values for an entire area until the next full re-evaluation, which could be every 3, 7, 10 years or only when the property changes hands. Find out when the last full appraisal was in your area and how the value has been calculated since then. The longer the time has been since the last full appraisal, the more likely that the assessment value is off. Make sure the description of your home is accurate. Verify the lot size, the number and type of rooms, and the square footage. This is very important so look closely. Look for mistakes, such as a half-bath recorded as full bath or a screened-porch that’s included in your year-round living space. It happens more than you think, so double check. Look at public records at the assessor’s office to see how your home stacks up to comparable homes in the neighborhood. “Comparable” means homes of the same size, age, and general location. For example, homes near a busy road are valued less than those next to a quiet park or wooded area. Hire a realtor or an appraiser if you can’t do the legwork yourself. Determine if your tax savings warrants a challenge … will the payoff be worth the effort? If your assessment seems high and unfair, make sure you have the proof and the paperwork to back up any claims. You can’t just cry wolf so be prepared. The appeals procedure will vary by jurisdiction and it is critical to understand the system — deadlines vary. Again, you may want to seek the assistance of a tax professional, appraiser, attorney, or real estate agent to help you out. Don’t feel like you have to do this on your own, please reach out to us! We’ll make sure you have the correct forms to send for your appeal. We can help you with calculating your home’s values by sending you a market analysis report.